Astronomers have discovered more than seven Earth-like and sized planets orbiting the same star 40 light-years away. These findings were also published and announced at a news conference at NASA Headquarters in Washington. Such discoveries outside of our solar system are rare, as the planets have an exceptional winning combination of being similar in size to Earth and being all element, means they have water on their surfaces to potentially support life. As per Michael Gillon, a lead study author and famous astronomer of the University of Liege in Belgium - This is the first time that so many planets of this kind are found around the same star. While the seven exoplanets were found in the tight pattern around an ultra-cool dwarf star called TRAPPIST-1. As per the estimates, their mass also indicates that they are rocky planets, rather than being gaseous like Jupiter. Among these planets, three of themare in the livable zone of the star, known as TRAPPIST-1e, f, and g, and they may also even have oceans on their surface. Researchers say that TRAPPIST-1f; in particular is the best for supporting life. Compared to other exoplanets; It’s a bit cooler than Earth. It could be suitable for the right atmosphere and enough greenhouse gasses. However the TRAPPIST-1 sounds familiar, that’s because the researchers announced the discovery of 3 initial planets orbiting the same star in May. The new research has increased the number to seven planets in total. In words of AmauryTriaud - we’ve made critical investigations in finding if there is life out there. “I don’t think any time till now we had the right planets to discover and find out if there was -life. Therefore, if life managed to flourish and releases gasses similar to what we have on Earth, we will then know." Life may begin and develop differently on other planets; so discovering the gasses may indicate life is key. These discoveries can be a significant part of the enigma of finding the habitable environments and places which are beneficial to life. 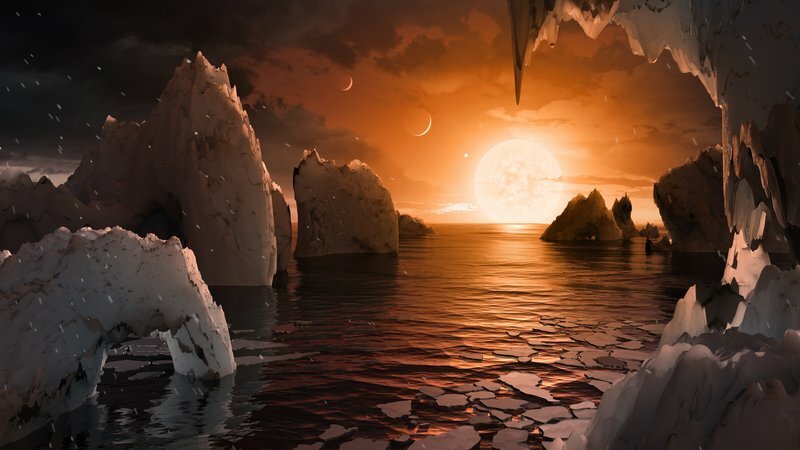 According to Thomas Zurbuchen, an associate administrator for NASA’s Science Mission Directorate - Answers the question by saying — 'Are we alone?’ is a top science priority, that is started to find so many planets like these for the first time in the habitable zone is a remarkable step going to forward toward that goal. The planets are so close to each other and the star. The seven of them are within a space five times lesser than the distance from Mercury to our sun. This closeness allows the researchers to study the planets in detail as well, in advance insight about planetary systems other than our own. Starting from the closest to the star and moving out, these planets have respective orbits from one and a half to just about 13 Earth days. The orbit of the furthest planet is still not known. If you stand on the surface of one of the planets, then you would receive 200 times lesser light than you get from the sun, but you would still receive as much energy to keep you warm since the star is so close. It would also give some striking views, as the other planets would also appear in the sky as big as the moon; or even double time big. On TRAPPIST-1f, the star would become visible three times as big as the sun in our sky. And because of the red personality of the star, the light would be a salmon shade. Based on a preliminary climate model, the researchers believe that the 3 planets closest to the star may be too temperate to support liquid water, while the farthest planet, TRAPPIST-1h, is most likely too far-away and too cold to hold water on the surface. But the researchers need to do further research in order toknow more for sure. TRAPPIST-1 hardly classifies as a star at half the hotness and a tenth the mass of the sun. It is red, not bright and just a bit bigger than Jupiter. However, these tiny ultra-cool dwarf stars are familiar in our galaxy. They were largely unnoticed until Gillon decided to study the space around one of these dwarves. While the researchers used a telescope called TRAPPIST to watch its starlight and changes in clarity. The team also saw shadows, like little eclipses, occasionally interrupting the steady outline of starlight. This is called transiting and the shadows indicated planets and more observation confirmed them.